In the late evening hours of December 2nd, the Montreal Canadiens announced the passing of legend Jean Beliveau at age 83. Dubbed “Le Gros Bill”, Beliveau was the ultimate ambassador for the Habs and the game of hockey. He was the very definition of a gentleman, a class act who will always be remembered. As a player, he was the prototypical big centre standing at an imposing 6’3″ 205 LBS. He put up 1219 points in 1125 career games, winning 10 Stanley Cups as a player, all with the Montreal Canadiens. He currently holds the record alongside Saku Koivu as the longest serving captain in Habs history. He would have his name inscribed another seven times on the Cup after his retirement as an executive for the Habs. He is second in all time scoring for the Habs behind only Guy Lafleur and only Henri Richard, Larry Robinson and Bob Gainey have played more games. As good as Beliveau was on the ice, it was who he was off of it that will define his legacy. The NHL’s ultimate class act, Beliveau always took the time for the fans. Pictures, autographs and favours were welcomed by him and even in later years, he appeared more than happy to oblige to a fan’s request. I distinctly remember watching Habs games and they would pan to Beliveau in his signature seat behind the Habs bench at the Bell Centre and I would see fully grown men absolutely giddy at the sight of their childhood hero. In an era where athletes are more inclined to act like spoiled brats or see a guy like Evander Kane pose with stacks of money, Beliveau’s class was second to none and there are more than few people out there who could use him as an example. The hockey world loses a truly exceptional man. The ravages of time have gripped the game in recent weeks with the passing of legendary coaches Pat Quinn and Viktor Tikhonov and the health issues surrounding Gordie Howe have been heartbreaking. The Montreal Canadiens will no doubt intend to honour Beliveau like they do with every legend. 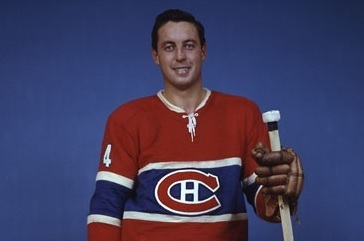 But Beliveau holds a special place in the hearts of Habs fans. Maurice Richard may have been the fire during the Montreal dynasty years but Beliveau was the steady hand, the leader who can be counted on night in and night out and always play the game hard but never crossing the line. I was too young to ever see him play but watching old highlights and the way he conducted himself was enough for me to know how special he was. Beliveau will always be a hockey legend and the very thought of him gone seems almost impossible. That’s the kind of impact Beliveau had. Rest in peace Jean.